Check out this gently-used 2017 Subaru Outback we recently got in. With its full CARFAX one-owner history report, you'll know exactly what you are getting with this well-kept Subaru Outback. 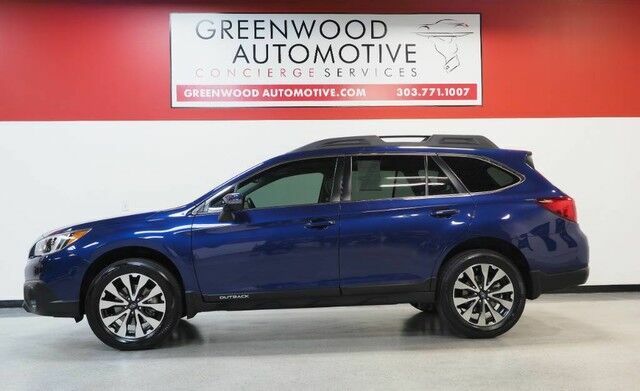 This Subaru Outback Limited is an incredibly versatile vehicle that is a "must have" for any family. Start enjoying more time in your new ride and less time at the gas station with this 2017 Subaru Outback. This Subaru Outback Limited comes equipped with all wheel drive, which means no limitations as to how or where you can drive. Different terrains and varying weather conditions will have little effect as to how this vehicle performs. The Outback Limited is well maintained and has just 28,976mi. This low amount of miles makes this vehicle incomparable to the competition. Rare is the vehicle that has been driven so gently and maintained so meticulously as this pre-owned beauty. More information about the 2017 Subaru Outback: The genius of the Outback has always been its ability to straddle classifications; it helped create the crossover segment in the 1990s. As such, the Outback competes with family cars, SUVs and, of course, other crossover vehicles. With a base price just short of $25,000, the Outback should be affordable enough for families considering a new Camry or Accord. With better off-road credentials and a more usable luggage compartment, the Outback offers increased versatility over plain Jane family sedans. At the same time, the Subaru Outback offers the kind of fuel economy that most mid-sized SUVs struggle to match. Strengths of this model include fuel-efficient transmissions, standard all-wheel drive, good ground clearance, Versatility, and spacious interior WWW.GREENWOODAUTOMOTIVE.COM for all Photos Our Dealer Handling fee of $499 is included in our advertised price. Government fee's and licensing are additional costs. For best service and to check availability or to set an appointment to see and drive call Steve direct at 720-339-1516 or Marc at 303-552-7909 For more information. FINANCING AVAILABLE. TRADES WELCOME. *VEHICLE IS FULLY INSPECTED BY OUR MECHANIC. We are located 4 Blocks West of I-25 on North side Of Arapahoe, Behind US Bank at Syracuse St.